Visiting from the Blogger’s Corner.. Your weekly mean plan sounds great! I have picky eaters in my family so they don’t like what I like to eat . What do you suggest in a case like this? Thank you and the meals sound good. Gave me some great ideas… Thank you! yummy looking week! you know I was so inspired by you that I have started meal planning. 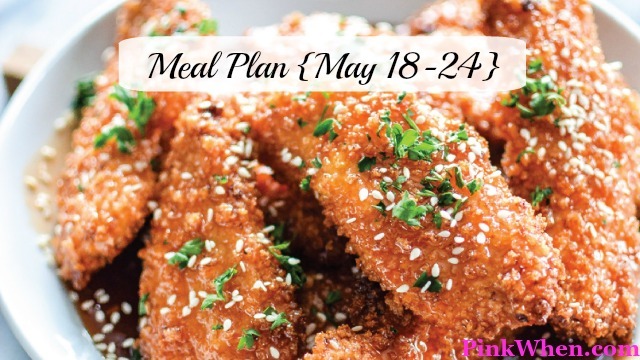 I am doing two week meal plans because i was getting sick of spending hours every week at the grocery store. Now I do ‘groceries’ every two weeks and go to a farmers market or a fruit/veg store the other week. Thanks for the inspiration! Another great menu of yummy meals! I think everything in this menu sounds good. Our meals this week will be quick and easy, because hubby is in charge while I’m unable to use my right hand (after thumb surgery). Yum! Do your kids enjoy all of these meals as well, or do they get a spin on them? We like to do the same meal for the whole family but it is sometimes difficult to please a little one, as you must know!!! Delicious looking meal plan as always! My kids have been complaining that there is not enough non-desi food on the menu, I really need to work on that. This week I’ll be doing a meatloaf and tacos too! mmmmm… will have to check that hoisin shrimp recipe out for sure!! !